With Newsletter2Go, you can set your account to your own time zone – or to that of your customers. No matter where you are in the world, you can select whatever time zone you like. To update the time zone within your account, simply go to your profile settings and choose from the drop-down menu. Here you can also adjust the date format. Timing is also a crucial factor when it comes to your customers. You want to make sure that your emails arrive at suitable times – not in the middle of the night or the early hours. Our email marketing software has been designed to make this easy: for highly effective email campaigns, you can set the time zone for each newsletter. Even if your customers are spread out across the globe, you can still send well-timed emails that land in the inbox at just the right moment. Don’t waste time working out time differences or sending emails manually at impractical hours; set up the time zone and schedule your email campaigns in advance. 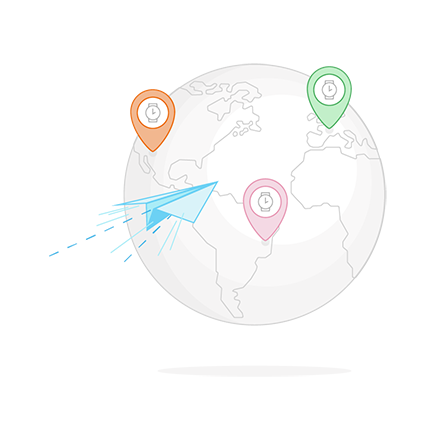 Scheduling email campaigns according to time zone is not only a matter of convenience. Send time can also impact how your audience responds to your emails. If your email arrives at an unusual time, there is every chance that the recipient won’t even see it in their inbox. Getting the send time right can help to boost your open and click rates – so be sure to take the time zone into consideration. Try experimenting with different send times and use our email tracking features to see what yields the best response. Navigating different time zones can be tricky, but our software makes it easy to manage your contacts and find the optimal moment to email them. By customizing your newsletter dispatch, you can send your campaigns at a time that suits your audience – no matter where they are located. Do you have any questions about time zone setup with Newsletter2Go? We’re happy to help – just send us a message or visit our contact page to find your local phone number.